1Remove the pork roast from the refrigerator and let warm to room temperature on the counter for about 30 minutes. 2Light the grill for indirect grilling. If using a charcoal grill, light an entire chimney full of coals and let burn until there is white ash on the top coals. For a gas grill, light half of the burners to high and leave the other half unlit. 3Whisk together the dijon mustard and balsamic vinegar. 4Add in the rosemary, garlic and thyme, combine well and then set the mixture aside. 5If using a charcoal grill, pile all of the lit coals to once side of the grill and put a drip pan under the grate on the cool side. 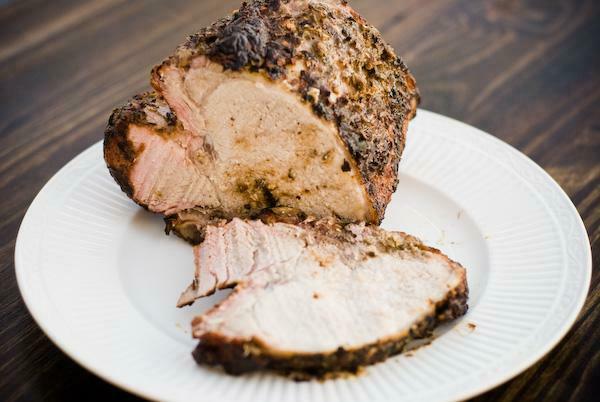 6Rub the pork roast all over with Kosher salt and fresh ground black pepper. 7Sear the pork roast on all sides on the hot part of the grill. 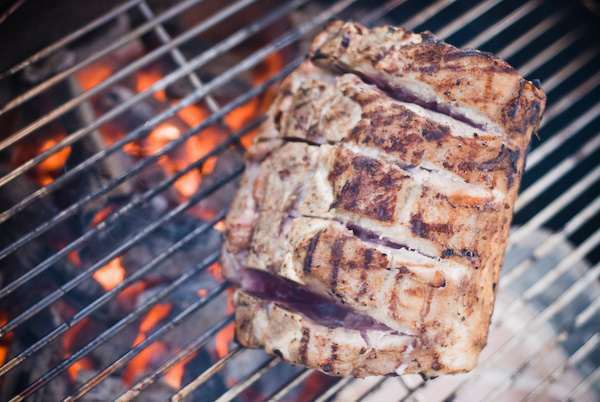 1Once the pork roast has been seared on all side, move it over the drip pan on the cool side of the grill. 2Smear the mustard, vinegar and herb mixture all over the pork roast. 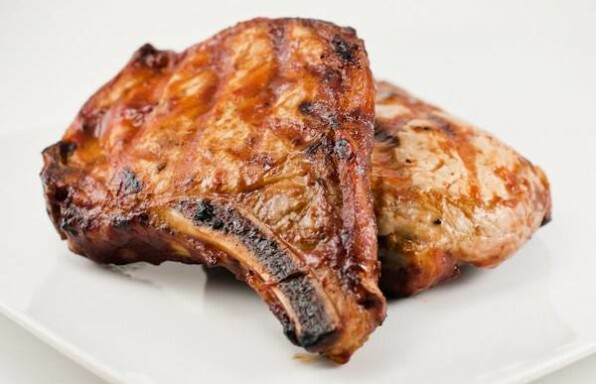 1Close the lid and grill the pork roast until it reaches an inner temperature of about 145 degrees. 2Remove the roast from the grill, place on a platter and loosely cover with aluminum foil. 3Let the roast rest for about 10 - 15 minutes before carving. Seriously, leave it alone, let it rest! 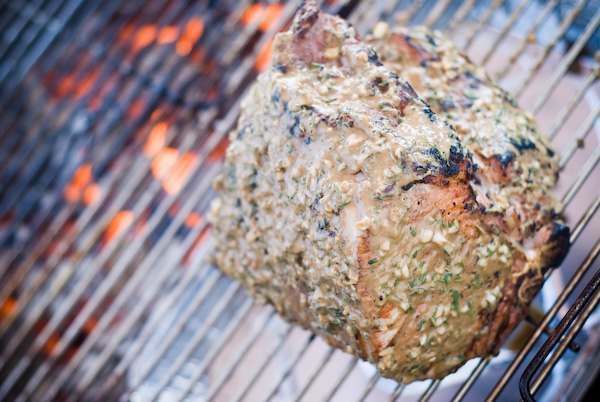 If you have some time, it wouldn't be a bad idea to brine the pork roast prior to grilling. I didn't think that far ahead and it still turned out juicy and delicious. Now if you'll excuse me, I need some quiet time to reflect back on this beautiful piece of meat. Oh Roast, you were gone so fast I hardly knew ye...sniffle. This was fantastic! I used a pork loin (boneless). Moist meat. You MUST let it rest. That is key. I will make this many, many times. Outstanding. The crust is deliciously awesome. I used 1 Tbs of garlic paste in place of the two Tbs of minced garlic (was afraid of too much of a garlic flavor). We’ll do this one again for sure. This is a real crowd pleaser here at Chez Walker. If you’re as poor a planner as me, you can dry-brine the roast by rinsing it well and drying it off. Rub the salt on and let it sit in the fridge as long as you can before cooking. Even a half hour or 45 mins makes a difference. Rub down with fresh cracked pepper and follow the recipie from there.